It’s not barefoot running, ok? It’s running with a very light shoe. 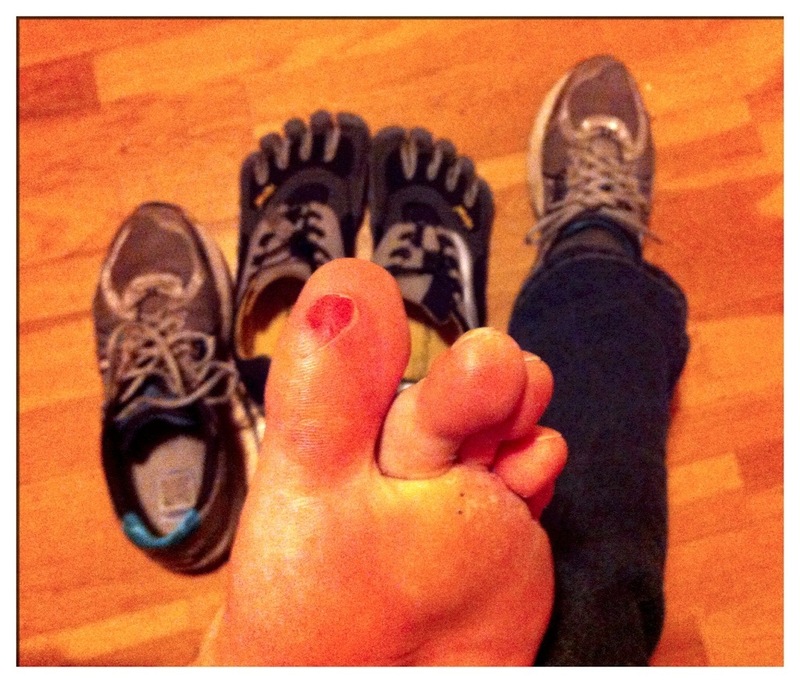 That aside, blisters and Vibram Five Finger shoes are not something I would associate with each other untill this week. I have been incorporating minimalist running into my training since January and have been very pleased with the progress. You see, I run like a bull, but think I float like Rudolf Nureyev, my gift in life, is to be self delusional in the face of logic and experience. Hence, my purchase of the Vibram Five Fingers. They have been the tool used to help me improve my running posture. Dr. Nicholas Romanov developed a technique for running called the Pose Running Technique, and I have tried to incorporate his advice into my running and have been enjoying the results and running injury free all year. That is until, caution was thrown to the wind and instead of a gentle 9km trail run in the hills behind my house I ran hell for leather in the ‘vibes’ for 18kms. It was an absolute blast, and a joy to feel my legs up the cadence in a really smooth manner. On finishing the run I realised a nice callus on my big toe had torn off. No debate, no heat build up that I could remember, no pain. It was just gone and that was that. Time to accept that I’d have a stinging big toe for a couple of weeks. The aim is to run a twenty miler this Sunday, so a few swear words fell out of my mouth. No big deal really, but out of interest, I started to really poke around inside the toes of the vibrams, lo and behold, the cause of the problem was simple. Inside each toe, especially the big toe and little toe of each shoe was a nasty ridge of cloth where the shoe liner met some other part of the shoe. I put aside some time and visited several different running shops and checked out what vibrams they had on display. It was a surprise to find that my shoes were not exceptional. Especially my version of the shoe had the most pronounced ‘ridge.’ It certainly felt sharp, and was most likely the reason for the rapid blistering. Finding a temporary solution to the problem, blister repair patches was easy, they were a bit awkward to cut and fit over the nastier ridges in the vibrams, but hopefully they’ll do the trick. I would hate to have to give up my vibrams, but still Inov8 and several other shoe makers have shoes worth looking at. There was over run 800kms in my last pair of Brooks Adrenaline shoes, and I have yet to get a blister from them. They are so good I picked up another pair that are currently getting broken in. Next chance I get, I’ll give the Vibes a run out, hopefully next week before I taper into the Clonakilty Wavefront Marathon. Let’s see if they gift me any more blisters, or have I done enough to avoid them?